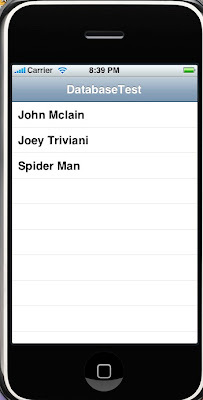 In this post I will be creating a calendar, which could reused in an any native application. I used the calendar source from here and modified it a little bit to suit my requirements. You can download the complete project from the link given, I will only discuss how we can reuse this calendar and modify it to fit our specific requirements. Open the project CalendarTest in xCode. You will find a folder Calendar containing some 20 files. You can reuse this folder as such in any project you want show the calendar. I will be using these files to display a modified calendar in CalendarTestView header and implementation files. 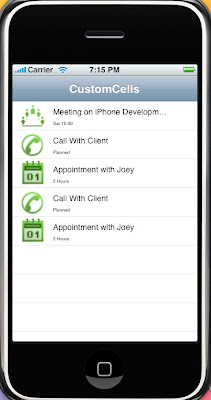 Here I have initialized a tableView and the calendarView with appropriate frames. You can change the frames if you want to change the respective size of tableView and/or calendarView. Here you need to write the code that should be executed when a tile is tapped. 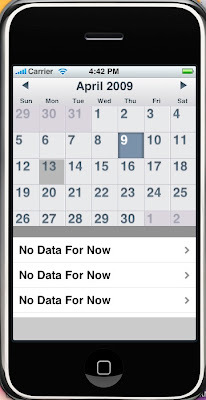 Typical usage of this method would be to load data for the tableView from database corresponding to the date of the tile. This method is called for each tile. Just like cellForRow is called for each cell. Please note that although this method will not be called more than once for a tile, but when you change the month of calendar, all tiles are redrawn, so this method will again be called for each tile. You can find a commented line in this method! This is very important code which you can use to tell the user that they have some data corresponding to a date. For example I have a meeting on 4th of current month. You can check if tile.date == 4th then check-mark the tile. This method is called every time you change the month in calendar. I have done some adjustments for fixing the free space between tableView and calendar when there are less number of weeks in a month. You can wrote your own logic for that. You can read data from the source which maintains data according to the last tile tapped. So to start, create a new project, chose the template "Navigation Based" and name it as "DatabaseTest". 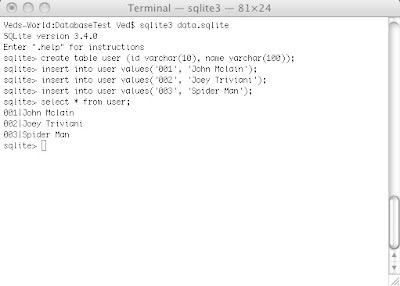 We will be using SQLite3 database and for that we will need the libsqlite framework. Right click on frameworks->Add Existing. In the search bar type "libsql" and it will show you some 4 frameworks with same name. You have to choose "libsqlite3.0.dylib" whose size is 1.7MB. Now we will create a database that we will be importing into our project later. Open the terminal and navigate into your project directory. Execute ls to verify that you are in correct folder. You should see the following screen on your terminal. Check to see everything went fine. Now we will import the database into our project. 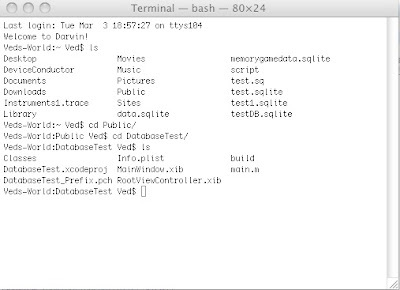 Right click on Resources->Add->Existing File and select data.sqlite. This will add data.sqlite file into Resources folder. There you go! build and run the project and you should get the screen we saw in first image. I have not covered very basic details, if you still need some I would suggest you to read my previous posts. In next post I will be showing you how you can edit the table we created and also add new records to it and persist them into database.